Cabinet painting is very popular today. The trend has been away from stained cabinets and toward painted. Sometimes homeowners wants to coordinate other kitchen remodeling around the same time as the cabinet work but are not sure on the scheduling. Is it better to have the cabinets done first and then get new countertops? or do you want to get that new floor prior to having the cabinets sprayed? 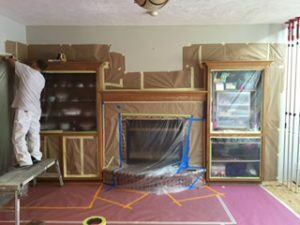 There are several different approaches that be taken when doing a cabinet painting project. All things considered I prefer to be the last trade on the project but we can usually accommodate most scheduling. If you have your cabinets done first you might expect to have areas that will need to be touched up from possible damage from other trades work. This is something that can occur when for example you have a new counter top installed, etc. What usually does not work is having other trade work go in tandem with the work by the paint contractor. Sawdust and grout don’t go well with paint finishes. Paint contractors need a clean environment to work in and spend a fair amount of time cleaning and vacuuming an area prior to getting to work.